Sportdog SDF 100A In Ground Fence System is one of the most reliable and durable system that you can buy for larger installations. High quality and affordability are other aspects that will make you to fall in love with this system more. Before purchasing, ensure that you read this review. Whom is Sportdog sdf 100a wireless fence Suitable for? For Dogs weighing 10 pounds or more. What's Included with SPORTDOG SDF 100Acre - In Ground Pet Fence ! SportDOG Brand Sdf-100a is a safe and simple system that comes with various features that will impress you. The system can expand to allow you train various dogs at the same time. Some of the features that make it to stand out from the rest include but not limited the following. For many years, SportDOG has been one of the leading companies when it comes to making high quality and heavy duty collars. SportDOG Brand Sdf-100a In Ground Fence System is a good example of the high quality products from the same company. The collar is among the sturdiest as well as strong built systems that you can purchase for your pet training exercise. The waterproof design is one of the attributes that will make you to fall in love with this collar even more. Compatibility is among the most important things to consider when it comes to buying a dog training system. We noted that the system is highly compatible with PetSafe Stubborn, the PetSafe Little Dog collars and PetSafe Deluxe collars. This allows users to mix and match the collars in order to suit the needs of different dogs. This means that you can train dogs with different sizes as well as temperament. Do not waste money and time purchasing other systems when this is one of the best. The collar comes with a 9 volt battery. The battery should be replaced within a period of three months. However, getting to the battery of the collar is a bit tough for users. You need to use a screw driver to unscrew all the four screws holding it in place. Fortunately, the battery can be purchased at an affordable price. Users have to unscrew the collar prongs with the help of a pair of pliers. The system comes with short and long probes that make Sportdog sdf 100a suitable for both long hair and short hair dogs. The collar has four levels of progression correction. This makes Sportdog sdf 100a easy to increase the strength of the collar so that your pet can remain within the right correction zone. It also has independent correction levels such that you can choose a different correction level for each of your pets. This means that you can train more than one pet at a time. In order to adjust the correction level, you need to use a coin so that you remove the plastic lid protecting the adjustment button located beneath it. The collar has been attached using a rubberized collar band to make it properly. The band has metallic fasteners and a closure with a belt buckle style. Although some people prefer using the quick snap buckles, this type also works well. The collar of the collar makes less visible when compared to other brands on the market. Nonetheless, this does not compromise with it effectiveness when it comes to dog training. The collar does not have a battery backup like most of the highly rated brands. If you prefer a device with a battery backup, then you can consider pet safe. The width of the battery is easily adjustable with the help of a dial located on the side of the transmitter. You can change the distance extended by the boundary zone from the wire boundary. Unlike EF- 4000 and Dogtek EF-6000, Sportdog sdf 100a the boundary correction, as well as the warning distances, cannot be adjusted independently. Instead, they are moved together. The system includes a tester tools that allows you to check whether the collar is functioning or not. Therefore, you do not need to look for a patsy shock in order to determine if the system is working as expected. The long range transmitter has a 100 acres of capacity to take care of the needs of your pet. 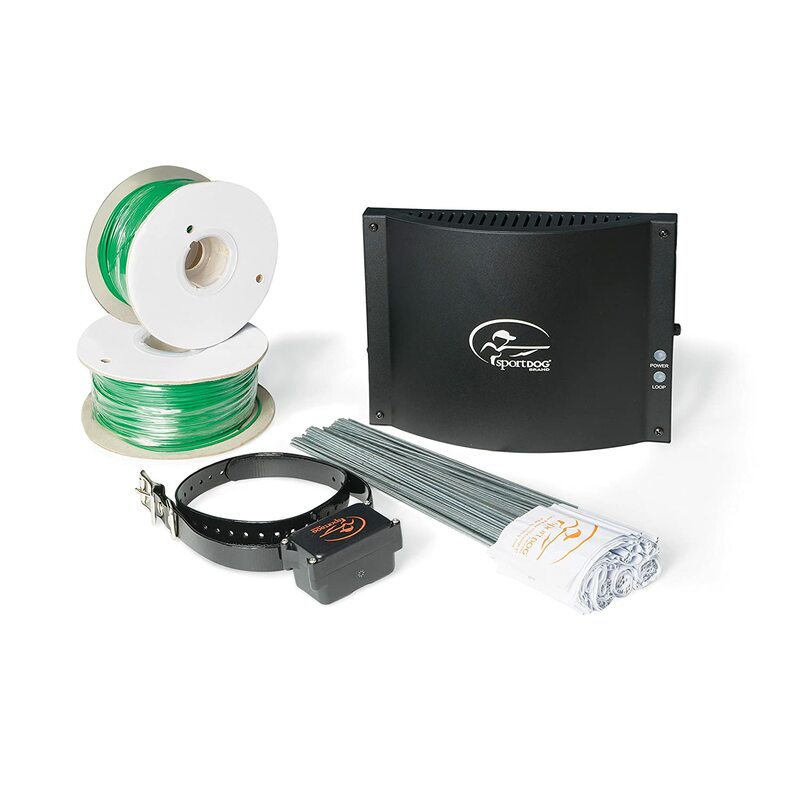 In summary, Sportdog sdf 100a In Ground Fence System is a perfect system intended for larger installations of up to 100 acres. The unit comes with a sturdy collar that has a vibration warning. The manufacturer has made it to be waterproof such that it can be used under different weather conditions. To purchase the collar, you can check with online stores such as Amazon for better deals over the same. With this system, training your dog is not going to be an uphill task even if you are a novice in this field.